NOTE: the majority of this piece is pure Gonzo, in the classic HST style. Written, as it were, on the fly, or at least "on the roll", while car 25063 was lurching through the night and day of its trip as part of train 50. We will make something of an attempt to separate the pure commentary from the objective observations of the trip. Well. Other than that, this is presented with minimal editing except to incorporate some handwritten notes and translate some of the Desk's typed "shorthand" into something readable. Well, at least the baby waited until the train was moving to start crying. And as an experienced father, grandfather, stepgrandfatherinlaw, and all the rest of it, the Desk recognized the cry as simply the infamous "fussy baby cry" and not anything that was serious. And so began one of the journeys of greatest dread in the Desk's somewhat less than mundane existence. For reasons that needn't be gone into yet, the Desk had elected to take AMTRAK instead of flying, and so it willingly and knowingly subjected itself to to a scheduled 24 hours of, an interesting trip. Well, that is to say, the journey began almost exactly seventeen minutes late. No, Amtrak doesn't keep to a third world train schedule where regular passengers don't even become curious as to the reason for the delay until at least three hours past the scheduled departure time. But with the national passenger rail service of the United States bleating about how they are working to establish high speed rail links over a majority of their route, you would at least expect them to keep to something of a tighter schedule. With the CRF station only a couple of stops out from the point of origination for the train, and now a quarter of an hour late, by the time the train gets to the halfway mark it may be running by a third world timetable. Now as to the quality of the ride, at least so far. There IS no quality to the ride. Judging by the sights creeping by the window, the best speed this thing has gotten to may be about fifty miles an hour, and the reason is that the tracks are simply too rough to support anything resembling passenger rail service speed in places like Europe and Japan where they take it seriously. The jostling and jolting from the uneven joints and dips in the roadbed turn the passenger car into something probably best experienced otherwise at a State Fair. According to the booking information, there are dining cars available. Given the state of constant random motion seen so far in a regular coach, one couldn't imagine trying to eat a sit down meal at a table with a plate and silverware and all that. There have been sudden full car convulsions that have threatened to make a gift of the Desk's laptop to its neighbors across the aisle while it was typing, what would that have done to a pork cutlet and some green beans? Note for future reference, Amtrak coach seats do NOT have seatbelts. 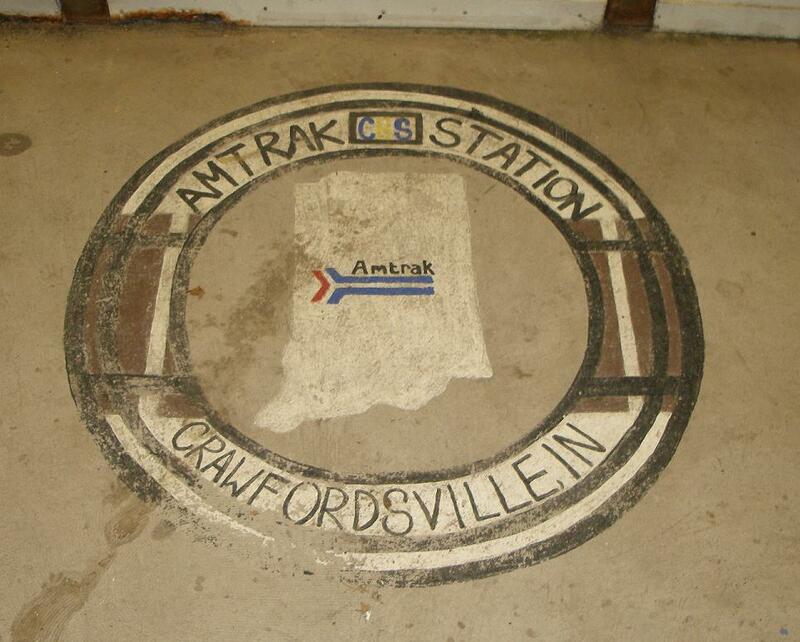 The 'black thing' inside the pillar in the Indianapolis station is a brake line coupling for train cars. One has to wonder which train pulled out without it! 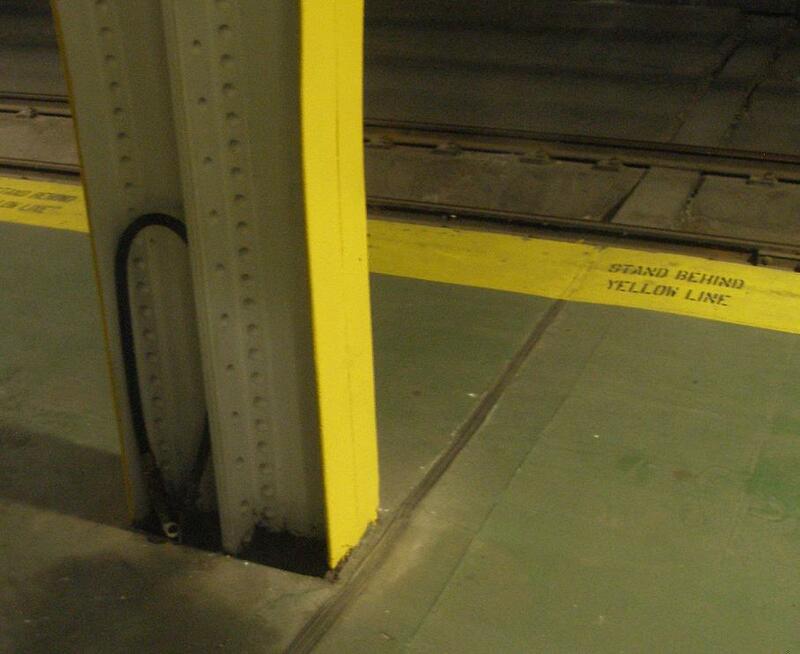 The warning about the yellow line will make an appearance later in the Desk's "Warnings and Disclaimers" photo collection. Amtrak, as represented by this one train, is well on its way to give the best of the banana republics a run for their money. 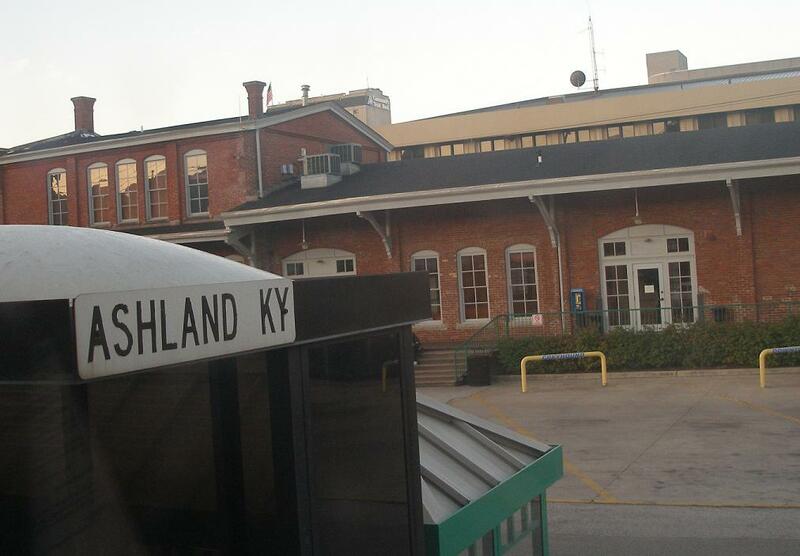 The scheduled time for the train to be standing still in Indianapolis was nine minutes. The actual time was almost an hour, during which a large number of passengers paraded out of the coaches to stand around on the platforms and smoke. The overall cumulative delay means that this train is now well over an hour behind schedule and hasn't made more than a handful of stops on its route. Leaving the city, there are innumerable grade level crossings. And most of them are less than ideal. In the rest of the world, at least if their travel videos are to be believed, high speed passenger rail makes something of a good attempt to avoid such things, either being elevated above or tunneled below, and when a crossing cannot be avoided, they are at least well maintained and no more interesting to the rail cars using it than the rest of the line. It would seem the same cannot be said for at least this run. And then there is the cafe car, it would the hours appear to be decided directly by congress. And are subject to change with or without notice or reason. Terrific. Two drunks joined the party in Indy. Already partially lit they found out that the on board bar several cars forward was still serving and went for more juice. They are now well on their way to finding each other hilarious, and including most of the car with their insight proclaiming that they are "Railing!" "Rail On!" etc. with a generous sprinkling of 'the seven dirty words' to all and sundry, and doing so with substantial volume. In their current condition, obviously intoxicated, they would have most likely been denied passage on an aircraft. The engineer did manage to make up some time, and there was likely a bit of padding built into the schedule. But still, the train was well over twenty minutes late pulling in, but the people with the upset infant got off anyway. The Desk tried to get a picture of the crossing of the Ohio River, but as is the way of its level of technology, and its well-known luck as a photographer, not to mention the massive girders they use to make rail bridges across major navigable waterways, it didn't work. Should we take this opportunity to discuss the 'potty' aboard a train? Perhaps compare it with a commercial bus, or maybe an airliner and evaluate the possible difficulties using such a facility while the vehicle is in motion? No, we'll skip it and go back to the deplorable state of the infrastructure of the American Railway Network. Not only is such a roadbed agonizing for the passengers who are continually shaken awake, it has to be just as rough on the train itself as hitting a string of potholes is to your car. There are suspension parts to train cars, besides the wheels and axles, which would undoubtedly last longer on something that resembled a smoothly laid track, you do have the Casey Jones equivalent of shock absorbers which take one hell of a beating at times. And we haven't even mentioned the engine. How good on it is all the dancing around on the tracks while under way? The thing is a massive and endlessly complicated diesel electric power plant with a collection of fantastically powerful electric motors down underneath. What does it cost to rebuild one of those monsters? Never mind buying a new one. Now, given all that, wouldn't fixing at least the worst of some of these sections of track be worthwhile for both reasons. Namely, it wouldn't destroy the equipment as quickly, and the passengers wouldn't feel like they'd been to Six Flags after a trip. Morning. Some fog here and there, and more outside along the rolling hills just south of the River as the train continues to snake its way east. Morning on the train is not being kind to the two that had indulged in a nip or two (or seven) during the midnight hour on board. Sympathy from those who had to put up with their nonsense, which included slouching in their seats whistling, is harder to come by than a gentle ride. By the printed schedule, which is supposed to be current and as it has a July 2013 date on it, we were due to arrive at 0627. When you compare the older station in the background with the 'modern' one with the town's name on it, you can see how much of the "romance of train travel" has been lost. This train was to arrive in Huntington at 0703. Here's to hoping there is more padding in the schedule. The train is stationary (a strangely appropriate pun) for seven minutes. Just over half an hour late pulling out, by the schedule. As we leave, the Desk has an excellent view of the massive CSX yard in Huntington. A reminder of the other commodities that use these same rails, and whose rolling stock suffers the same abuse as the passenger service. After careful consideration the Desk has decided to skip a visit to the dining car and a review of Amtrak's menu options for some dried apples and beef jerky from its traveling kit. Two reasons for this, the prices (over two dollars for a soft drink, more for other stuff, slice of pizza for six), obviously, and the bathroom. And now you have commentary from somebody other than a traveler with a cell phone talking to her sister, loudly. For at least an hour (until her phone lost signal) everybody in the car got to hear about her family's plans for the rest of the day after an upcoming funeral. The Amtrak lady on the PA said the dome of the West Virginia capitol building was refurbished with real gold leaf in 2005. 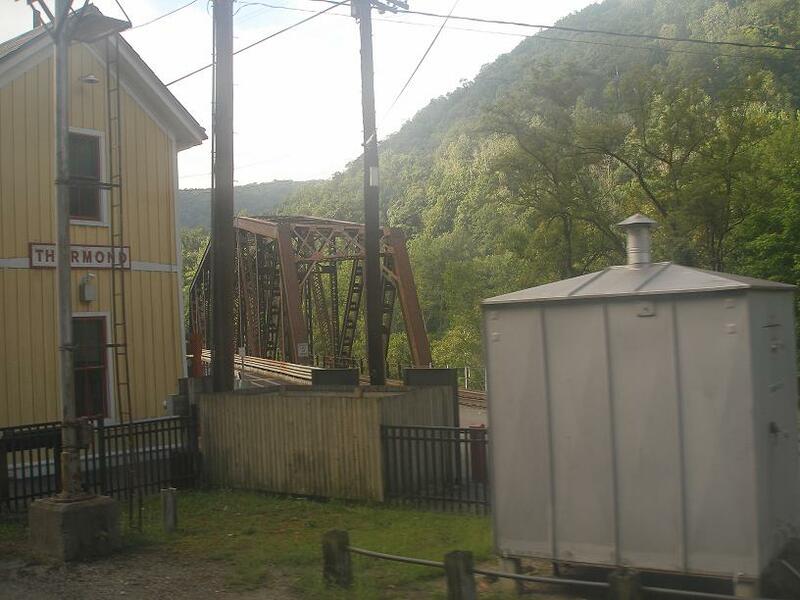 Thurmond, WV. Station and old bridge. And then there was the time the guy at the lunch counter decided to close the entire car, food service and seating area for an hour. While there were passengers in line waiting to be served, when the Desk asked why, one of them said something about that the attendant said it was his lunch break. The two booze hounds, who turned out to be father and son on their way to New York, have regained consciousness and discovered that it is now Wednesday and are doing their best impressions of the insurance commercial with the camel going on about 'hump day'. Trust the Desk on this one: if you have to get your best material from a car insurance commercial, you are an idiotic loser and no mistake. It would seem that being loud and stupid is an inheritable family trait. Well, we stopped there. And that's about it. Got to see it, trying to get a picture was useless. A fellow passenger notes: "five bars of signal but no internet." The Cafe car is open again. According to the drinking TV spot addicts a "white Russian" on the train costs $12 as you have to buy all the ingredients separately and make it yourself. Useful information that, and it saved the Desk a walk up to the cafe car to check it out for itself. Several long and unidentified tunnels going into VA, once you get used to the guide's commentary you come to miss it. Evidently, Amtrak, or at least this crew, believe the fake cigarettes are the instrument of a hideous and untimely death if used on the train, and so warrants the public humiliation of the young woman who had used one by the steward. The Desk observed that such bans are not about the appearance of smoking or the 'second hand' risks thereof, it is about control, and if that is to be policy system wide, it needs to be clearly stated in the travel information given to passengers. The other passengers who witnessed the official's berating of her and her 'toy' agreed. There have been places where the road bed has been less than awful, but overall, on more than half of this trip the speed of the train has been severely limited by the condition of the tracks, not by the general safety of the rated curves on the route. Still twenty minutes behind schedule, but have made up some time. Probably due to schedule padding. Still chasing the schedule. There hasn't been a drop of rain all day. There was some slight fog around sunrise but it has been otherwise clear. Judging by the lack of motion in the trees across the landscape as we go, there hasn't been any wind. No - earthquakes, cows on the track, or burning bridges, and both of the James Brothers are long dead. But the train has been late all day. Now working on eighteen hours of this journey, it is time to look at some of the reasons the Desk, and presumably others, take the train, and spend longer in transit than they would if they drove, and many times longer than if they had flown, if cost of the ticket were not a factor in the decision. In the Desk's case, driving was not an option, at least for this trip, there simply was not a reliable vehicle available for the journey. So option one, driving, was out. Second would be the proverbial 'the riding of the dog'. Taking a bus was an option, but it was even longer time-wise than the train, involved several changes of vehicle and at least one considerable layover, and thusly, was not a viable option. And now comes, flying. The Desk thought seriously about it. But, yet, it could not force itself to go through the aggravation, and humiliation, and having to undress in security, have things stolen out of its carry on and all that, the non-existent legroom on the plane, delays taking off, and circling to get a turn to land, and then having to see if my checked luggage went west when I went east. Again. There are good things and bad things to both. And Amtrak definitely has its bad points. One being the condition of the rails it uses. The other being the simple logistics of multiple trains, and multiple types of trains, all going different directions at different speeds sharing and crossing the same tracks. As well as aging equipment, misplaced priorities, and the need to keep the Political Corridor (Boston to Richmond) well-buttered. All contribute to a deterioration of service that, to begin with, was less than stellar. On the good side, the Amtrak coach was reasonably comfortable when the car was running on steel railroad tracks. When it was being dragged over cobblestones by earth moving machinery, it wasn't so good. Also, the car was air conditioned. Most of the time. For the majority of the trip the train was within shouting distance of being fully booked, which means the car was full of people. And at times, it got warmer than it should have. It was like after an hour or so of running on high the AC needed to shut down and take a break. Like the guy in the snack bar. Also, except for those who feel the need to chatter (loudly) for hours, and the drunks, most of the other passengers were pleasant and even interesting. During the trip the Desk had a 'seat-mate' of a culinary student on his way back to school from a summer of working at Glacier National Park, and then a truck driver heading east for a cross country job. The Desk is sure it found them more interesting than they did it. Amtrak wants to launch something along the lines of the Eurostar to serve the, shall we say, second tier of cities. Which means, say making a run from Chicago through Indianapolis and Cincinnati, and then on into Virginia, and doing so at a reasonable speed, with decent equipment, and service that says the paying customer is welcome aboard as the first step. This trip wasn't it. And you may quote The Desk on that one. By the published schedule, the train was supposed to be sitting in the Culpeper station at 1611, and arriving in Manasses three minutes before now. Doing good. Insurance commercial sequel from the paternal morons. 1720 The car's steward admitted that the train is half an hour behind schedule. But "things will be different once we get to DC." Isn't that the same line all the politicians use? 1745 Announcement: "Cafe car is closed until the train leaves DC." Note, if you are ever an Amtrak coach car steward, do NOT turn off the AC when people have been trapped in a slow moving jerky metal box with an overflowing toilet for over a day. If you do, as the gentleman who was tending to car 25063 on train 50 on this day did, you will instantly be labeled the AntiChrist and people will begin gathering anything that will burn. "DC twelve minutes", from the most unpopular steward on rails. 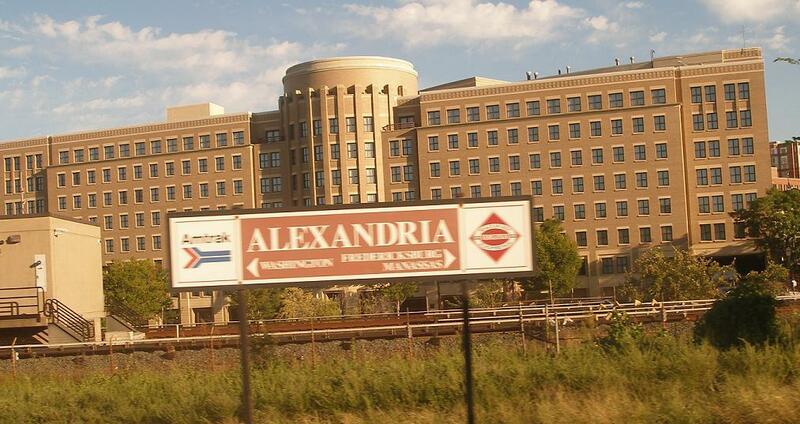 Rolling out of Alexandria at 1800 almost exactly. 1808 crossed river, over tidal basin, East Potomac Park, then into the concrete canyons. 1812 Sitting motionless on viaduct near VZ wiring center, not in station. Steward lied. 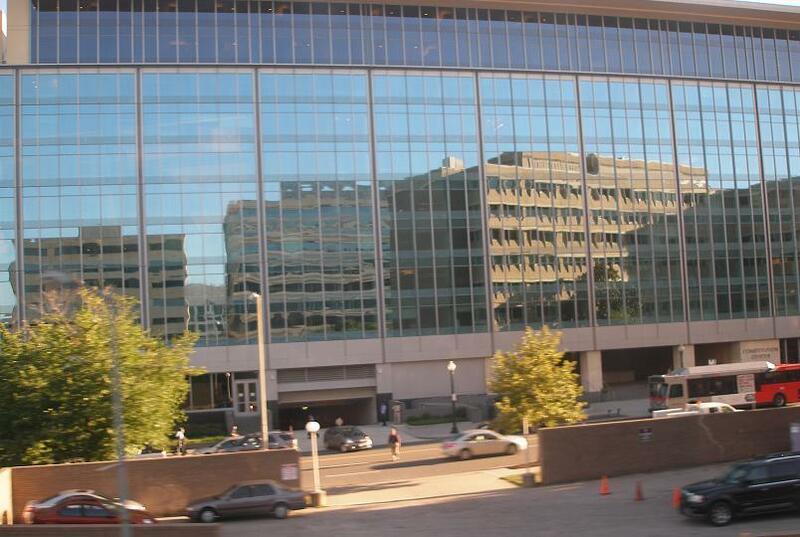 1817 DC Union station. Scheduled 1806. A lot of people got off in DC, car now about half full. Amtrak will take the diesel electric that has served us so pathetically all day and switch to an all overhead electric model that is fully capable of pushing 100 MPH or, more likely, living down to its petroleum fueled cousin's reputation. Man on the PA says 30 minutes to Baltimore and right at three hours to New York. 1848 train is moving the fastest it has all day. And in places, the tracks are just as rough as they have been all day. The related lowlifes have now informed the world that once they get to New York they are going to eat some pizza, then "smoke one" and go to bed. Evidently watching 'reality TV' makes one think that it is a good thing to share most of the details of your life with total strangers. 1853 "Dejavu all over again." Train has now slowed to a crawl and almost stopped a couple of times. 1856 Moving again and putting on some speed. The engineer appears to be trying to make up lost time. If train does not shake itself to pieces, we might do OK on the rest of the trip. 1913 Very Quick Stop! to the alarming smell of burning brakes. 1914 Back under way. However, it has been 30 minutes and we are not there yet. Another liar works for Amtrak. The Desk did notice that some of the ancient train tunnels going into the city are a bit unstable and the walls, and the pipes and wires hanging on them, come awfully close to the moving train. 1916 "Four minutes to Baltimore Penn Station." 1920 he was right this time. Supposedly it is 50 minutes by the schedule from Baltimore to Wilmington, Delaware. The guy on the PA says 45. Some would say it is at least an hour. We'll see. If Amtrak were to ask the Desk's opinion of their getting taxpayer funding to continue their expansion of nationwide high speed rail service, it would now laugh heartily and ask, "Has Mister Beelzebub has ordered a snow blower?" The Desk was so anxious to get off that purgatorial thing it forgot to note the exact time the train stopped in the station. They were close, but, predictably, a few minutes late. Exactly how much doesn't matter. 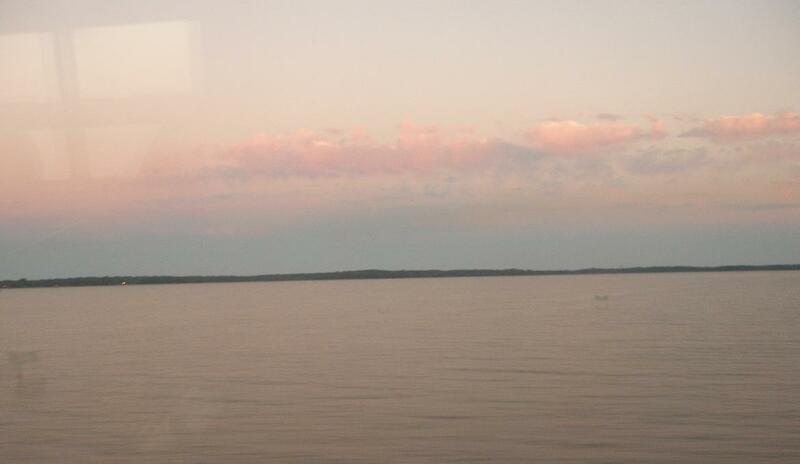 Looking out at part of the Bay between Baltimore and Wilmington as the sun sets behind the train. "if the situation arises again, would the Desk take the same train again?" Well, overall, the train was only a handful of minutes late, or so. The cost for the ticket was, give or take, a hundred dollars, whereas the cheapest airfare is twice that. So, it would have to weigh the options carefully. IF cost were no option and there was a "roomette" available, which come with a private toilet and sink, a door (that closes), meals, an available shower, and more, the answer would be a hearty "yes". And especially if you were going to do the trip with another person as the price is essentially the same for one or two and it is within arguing distance of the price of two coach seats, especially if you are expecting to buy a dinner for two on the train. But if it were just the Desk again, with a day to spare, and overall cost of travel were a factor, as it usually is, the answer would have to be, "maybe". The trip in coach wasn't THAT bad, especially given the most recent nightmare of traveling under the tender mercies of US Airways (curse-spit). If the only option was that perversion of air travel, then the answer would be "yes" it would rather deal with Amtrak than subject itself to both the TSA and that outfit. Otherwise, it'll be a close call, and it really can't say which it would pick. But the fact that the train is still in the running should say something.